Like many shots, this is another Willie Joplin origional. I named it the college shot for obvious reasons. Do you dig it? 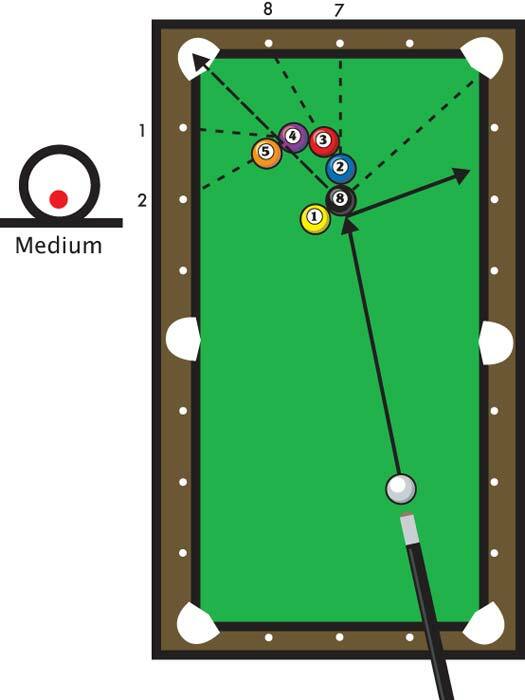 The 8 is on the foot spot with the 1 ball frozen in line with the edge of the right corner pocket, as diagrammed. The 2 is frozen to the 8 in line with the 7 diamond at the middel of the foot rail. Freeze the 3 to the 2 at diamond 8, the 4 to the 3 at diamond 1 and the 5 to the 4 at diamond 2. Willie designed the shot this way to prevent a kiss-out. It's important to set these shots up and freeze the balls as indicated. Hit the 8 as full as possible without hitting the 1. If you can't make this shot, give up and get a job.